Designer Bill Blass covered his furniture in off-white Sunbrella® fabric for good reason: it withstood his Labrador Retrievers, spilled glasses of wine and inky Sunday newspapers. 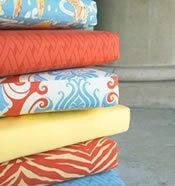 Sunbrella® fabrics resist stains and fading, so you can stop worrying about your fabric and enjoy life. With more than 500 indoor-outdoor fabrics available at Calico, you can decorate — and live — just the way you want, indoors or out. Dress up an outdoor entertaining space with bright stripes. 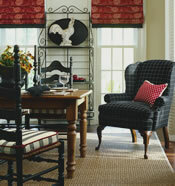 Reupholster dining room chairs in elegant fabrics that resist food spills. 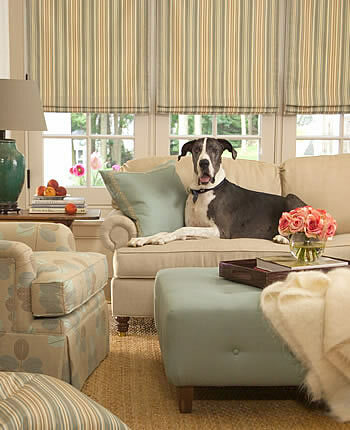 Reupholster family room furniture in outdoor fabrics that do not compromise on style but hold up to kids and dogs. Sunbrella® furniture fabrics contribute to healthy indoor air quality and have been certified by the Greenguard® Institute. Live in style — and don’t worry about the furniture! 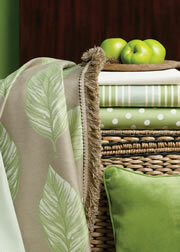 Outdoor fabrics are perfect for family rooms, kitchen and dining room chairs, outdoor cushions and patio umbrellas. They’re designed for anywhere you want your furniture to hold up to everyday life. 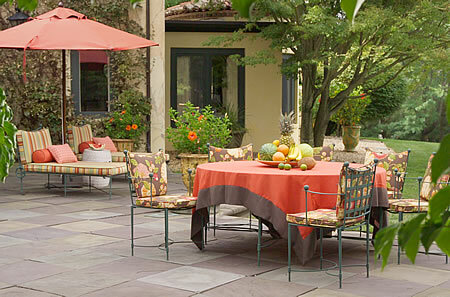 Most of our outdoor fabrics have a stain-repellent finish for easy care. Stains can be removed with mild soap and water. A mild bleach solution can be used on Sunbrella® fabrics to remove stubborn stains. 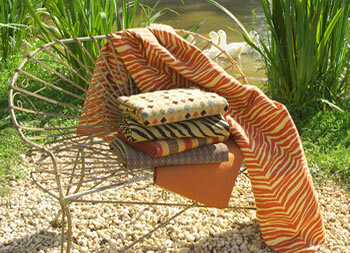 Outdoor cushions can even be hosed down. 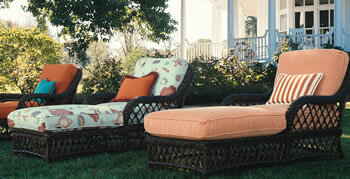 Consider fast drying marine foam inserts for your outdoor cushions. 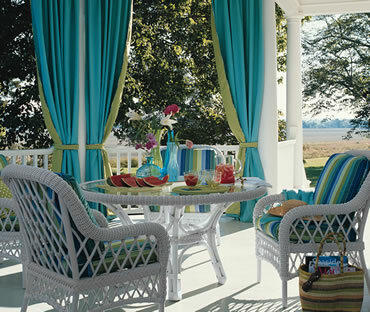 Outdoor fabrics such as Sunbrella® resist fading, mildew, water and soil. 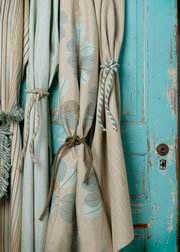 They’re ideal for use outdoors, inside near sunny windows, and in steamy bathrooms for shades and upholstery. 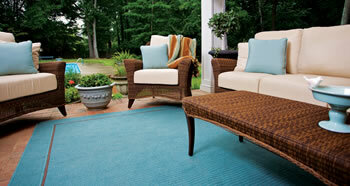 Acrylic fabrics do not support the growth of mildew, an added benefit for outdoor cushions or damp climates. Acrylic woven fabrics are about twice as fade resistant as printed acrylic fabrics or polyester print fabrics. In solution-dyed acrylic fabrics, the dye penetrates the entire fiber, rather than sitting on the surface. (It’s like a carrot—the color is consistent throughout.) Sunbrella® fabrics that are solids, stripes and jacquards have the most color fastness of all even through intense sunlight exposure and cleaning with bleach. 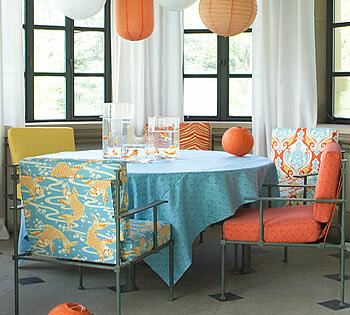 Indoor-outdoor fabrics that once were stiff as a board now come with a softer hand —you’ll find chenilles, velvets, jacquards, damasks and relaxed twill textures — even sheers. The bottom line: with outdoor fabrics such as Sunbrella®, you never have to compromise on style. Shop online now or visit our stores for an even larger selection. 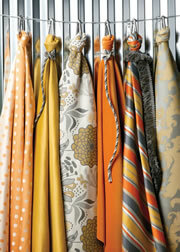 Fabrics shown below are from our expanded Sunbrella® Collection now available in select stores.